From the cocreator of the landmark series, the story millions of fans have been waiting to get their hands on for 25 long years. A vastly layered, wide-ranging history that deepens the mysteries of the iconic town in ways that will thrill disciples of the original series and will prep fans for the upcoming SHOWTIME® series like nothing else out there. Four original Twin Peaks cast members who are appearing in the new Twin Peaks for SHOWTIME® - Kyle MacLachlan, Russ Tamblyn, Michael Horse, and David Patrick Kelly - join three new actors - Amy Shiels, Robert Knepper, and James Morrison - to voice the audiobook edition of the novel along with cocreator Mark Frost and original cast member Chris Mulkey. Additional actors Annie Wersching (Bosch) and Len Cariou (Blue Bloods) are also featured, as is narrator Mat Hostetler. 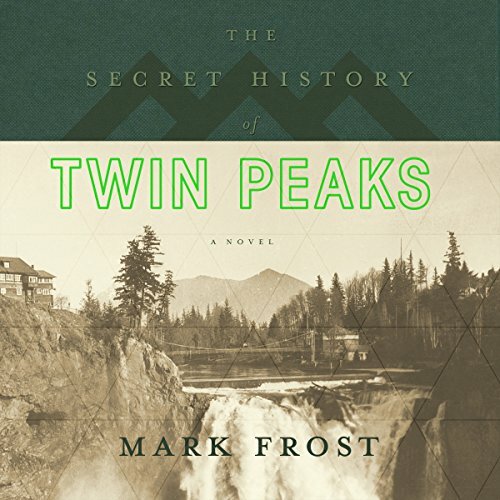 Of the audiobook, creator Mark Frost says, "I am thrilled that both original cast members and new actors will be coming together on this project to bring this other aspect of the world of Twin Peaks to life." Absolutely great for Peaks fans--but still, buy the book. This audio book brought great energy to the story. However, because Frost's brilliant tale is so uniquely structured visually--it doesn't translate well to a stand-alone audio book experience. The printed book itself is a masterfully designed experience--the story is told through a patchwork of newspaper clippings, postcards, government reports, autopsy reports, letters of correspondence, excerpts from novels, and all of this fabulously crafted miscellany is carefully annotated by an FBI agent. This scattering of documents was meant to be experienced and explored visually! The annotations NEED to be visual. I tried listening to the audio book by itself first--the nature of the compiled and annotated dossier did not translate smoothly to an audio book experience. It was easy to loose track of the larger narrative. Something was missing. But the performances of the readers, actors, and author are fabulous and should be heard. I ended up buying the printed copy and read along and studied the visuals in the dossier-format while listening to the audio--it was a phenomenal way to experience it and I highly recommend doing it that way. So for my five-star review I'm taking into account the overall cumulative experience of folding in the printed copy to experience alongside the audio book. As a twin peaks fan, I always wondered about a lot of things. This book works as a kinda prologue to the original story. The only exception is that it also feels like it's in the present. It gives background to a lot of characters and things that happened in the story. Amazingly is the fine detail and connection to the esoteric that rivals Foucault's pendulum, while keeping focused on the Twin Peaks story. Quite an accomplishment if not miraculous. If you are or were a fan of the series, this story will fascinate you. I am a huge huge huge fan of Twin Peaks. This book is the first new Twin Peaks content to come out since FWWM. Obviously, if you like Twin Peaks, you're already going to buy this. But I can give a little information on what Twin Peaks fans will get out of this. First off, this feels more like an X-Files story with Twin Peaks characters thrown in. It's not really a good thing or a bad thing. A lot of the book goes into UFO stuff in Twin Peaks. So if you were a fan of the Major Briggs deep space spooky stuff, this is for you. Now, what anyone really cares about: characters from the original show. If you want to learn more about some residents, that information is here too, but it the UFO stuff is really what the books about. Don't expect big answers like what happened to Cooper, but you will find out the fate of a few characters from the original show, which is for the most part satisfying. I also find the audio book a bit disorienting due to how often the narrators voice changes, but I eventually got used to it and it didn't bother me once getting full involved in the story. The returning actors as narrators is pretty cool too. Hearing the Dale Cooper talk about the history of the RR is really cool, as well as Dr. Jacoby, Hawk, and Hank Jennings actors lending their voices makes this feel like legitimate Twin Peaks. Spoilers ahead! I really enjoyed the book as a huge fan of the series. Frost's approach as a archivist's dossier with really interesting documents and pictures make this book shine. It feels believable. It follows the Jade ring from Native Americans to Lewis and Clark through to President Nixon and more. It was very heavy on alien conspiracies, more so than the series. There's a lot of changes that were made to the story of the TV show. Audrey goes to the bank to expose her father and his Save Ghostwood to stop Catherine with the hope of someday getting it back. She lives through the bank explosion. Big Ed and Nadine meet after Ed runs off to Vietnam rather than high school. Briggs is the archivist. There's a lot more I can't quite remember. Bobby was mentioned barely at all. Shelly and most of the kids went mentioned either. There's very little that has been added in the timeline from the last episode of the show until present day. I really liked the last half of the book. Despite it's weird changes I highly recommend any fan of the show read it. It definitely has me pumped for Season 3! This is all Mark Frost without Lynch, so it's space aliens, secret agents, fanfic-y backstories for obscure characters, and conspiracy theory stuff about freemasons and Alastair Crowley. Some Twin Peaks fans live for this stuff, but it's not why I like the show. For me, Twin Peaks is at its best when it's surreal, uncanny and not answering any questions. So, my reaction to this book was a bored shrug, and I'm hoping that in the forthcoming TV series Lynch will restrain Frost's rationalist urges and wallow in the unconscious instead. The best 9 hours you could ask for in an audio book from Mark Frost. Couldn't put it down she I first got the book, finished it in one long round trip flight. Nabbed the audio book to consume it again. This book is a wonderful introduction for the casual van and a delight for the hard-core fan! It goes into many of the things that were only suggested in the series. It takes the form of A narrative history of the region, with vignettes of the time period surrounding the series. It remains almost exclusively in the region around Twin Peaks, so don't expect much backstory about Dale Cooper and other characters who were not native to Twin Peaks. The reason I gave it four out of five stars for story is because I am one of those hard-core fans who noticed when things that occurred in this "history" were different from the series. But since this book was written by Mark Frost I can only assume that this is either the new official history of the region or that changes in this history or do two facts unknown to the "Archivist". Twin Peaks war in den Neunzigern erfolgreich, weil die Serie vollkommen anders war, als alles, was man bis dato aus dem Fernsehen kannte. Mit Twin Peaks setzten Mark Frost - und vor allem David Lynch - neue erzählerische und visuelle Maßstäbe. Auch heute noch gehört Twin Peaks ins Olymp der TV Serien. - Und dort sollte man die Geschichte auch lassen! Mit dem vorliegenden Buch zertrümmert der Autor sein eigenes Werk, indem er die Rätsel um Twin Peaks nachträglich zu konstruieren versucht. - Was sich sehr langweilig und unoriginell anhört. Ich würde dieses Buch erst recht nicht den Fans von Twin Peaks empfehlen. Lieber noch einmal die originale Serie schauen! Both in style and content, most of this book reads like a rewrite of the first few seasons of X-Files, With a bit of ID4 thrown in for good measure. As for those parts specific to the Twin Peaks story, it seems to be written by someone who has never really seen the original TV series. Numerous stories from that show are mentioned in this book, but completely rewritten and not fitting the original storyline. So if you enjoyed X-Files and want to read more about UFOs, aliens and multilayered government conspiracies, this is definitely your book. Twinpeaks fans, however, will find comparatively little concerning The original TV show and much of that simply does not tally. For all of us who are eagerly anticipating Season 3, this is a wonderful book to dive deeper into Twin Peaks lore and especially the stories of many of the secondary characters. The audio book offers an incredible cast of narrators, including many actors from the series, and the PDF with documents and images rounds out the experience nicely.